With fossils dating back over 200 million years, dragonflies are amongst the oldest insects in habiting our planet. Although still considered a large insect today, prehistoric dragonflies were brutes. Archaeologists have discovered remains with wingspans close to 30 inches. Belonging to the order Odonata, dragonflies are cousins of the demure and slender damselflies. At first glance, some fly fishers may confuse the two. These insects are different in both size and habits so it pays to know how to tell them apart. Wing position is the easiest method to separate the members of this order. Resting damselflies tuck their wings neatly along their backs. Dragons hold their wings outstretched, resembling helicopter rotors from a Vietnam era Huey. Nymph size and physique are radically different between the two. There are over 450 dragon fly species in North America filtered down through seven families. From a stillwater perspective there are two main families, Aeshnidae (Climbers) and Libellulidae (Sprawlers). In some circles, anglers refer to sprawling nymphs as Gomphus, but they are not. Burrowing Gomphidae or Gomphus nymphs are primarily river dwellers, only a handful species inhabit shoreline margins of lakes. Of the two main families Libellulidae are by far the most widespread with over 1000 species worldwide. Aeshnidae or Darners are however, the more recognized due to their larger sizes and aggressive nature. I once placed a small inch long Darner nymph in a thriving 30-gallon aquarium for study. Within 3 months, its size doubled, consuming just about everything that crossed its path. The tank resembled the aftermath of a medieval battle, empty caddis cases and severed scuds littered the bottom. Only a couple of leeches survived and it had tried to eat one of those! Make no mistake. Dragonflies are efficient aggressive predators, both nymphs and adults. They do not play well with others, including their relatives! A dragon nymph’s aggressive predatory ways exposes them to foraging trout and bass. If you plan to spend any time fly-fishing lakes, dragonflies are one insect you should be familiar with and comfortable presenting. Dragon nymphs are a year round staple food source in some shape or size. Although dragon fly adults are large and seemingly appetising to fish, invest your efforts imitating nymphs. Bass take adult dragons, trout rarely do. Although I heard of the odd report, I have never seen a trout take an adult, despite their obvious struggles, as they lay splayed and twitching in the surface film. Of the two families, Darners are the biggest. Adults attain large sizes with bodies up to 3.5 inches or longer, at times resembling small birds. Climbing Darner nymphs grow up to 2 inches, although 1 ¾ to 1 ¾ inches is a common average. Long shank hooks in sizes #4-#8 cover the bases and a size #6 is a good overall average. Sprawlers are smaller, both the nymphs and adults. 2xl size #8 or #10 hooks are good nymph choices. No matter the family, use larger patterns in the spring and early summer to suggest mature nymphs. During the fall, smaller sizes are wise choices to imitate the remaining immature nymphs. In addition to size, body shape distinguishes the two families. Sedentary Sprawler nymphs are squat and spider-like, designed to lay low and ambush prey. 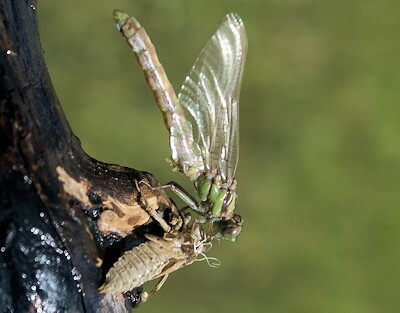 Darner nymphs are slender hourglass shaped, preferring to stalk and hunt through the aquatic jungle. Their heads and abdomens are their widest feature. Avoid rotund Darner patterns. All dragon nymphs have stout robust legs used to crawl amongst the vegetation or clamber from one location to another. No matter the family, stillwater dragons inhabit challenging locations to work a fly. Buoyant patterns tethered to fast sinking lines allow presentation into inhospitable regions. As with nymph fishing rivers, dragon nymphs must be placed in harm’s way to be successful. Avoid working the fringes, crawl and dart your dragon nymphs over and through weeds and debris. Dragon nymph gills are located at the tip of their abdomens in a rectal chamber. By expanding their abdomens, dragons take in a volume of water, expelling it through their gill chamber in a focused afterburner burst. A behaviour used by fleeing and migrating nymphs. Darners also use this skill to rush and pounce on unsuspecting prey. Darting nymphs scoot in short bursts, legs tucked along their sides. Libellulidae move in shorter bursts, front legs held out front, the balance swept back along their bodies. To mimic the naturals, leg materials should be a combination of strength and flexibility. Natural materials including pheasant and turkey tail fibres are popular as are synthetics such as silicone legs and Stretch Floss. Eyes are also an important Darner feature. Aggressive sight feeders, Darners have large visible dark eyes. Sprawler eyes blend in with the balance of their triangular head, and are not as critical to imitate. Rolling over a dragon nymph reveals a potent weapon, an under slung labium. Tucked below, this extendable lower jaw is lethal to any passing quarry. I have seen large darners fire this pincer shaped apparatus with lighting speed snaring an unwary scuds, water boatman or damsel nymphs. This feeding behaviour was a probable inspiration for Hollywood movies, such as Alien. Dragon fly adults share similar physiques; large heads, prominent compound eyes, short robust thoraxes and long slender tails. Depending upon the species some are squat others skinny but the basic configuration remains the same. Various subtleties identify species and families. Short squat bodies are typical of the Libellulidae clan while a club tail identifies Gomphidae members. As efficient predators, dragon nymphs are camouflage masters. Their coloration so convincing it is hard to locate them amongst a handful of weeds. Those wishing to study aquatic insects and invertebrates should take the time to scour aquatic vegetation before dropping the mat into an aquarium, unless a huge lonely dragon nymph is your goal. In clear lakes, nymphs are a collage of light colors in order to match their surroundings, light olive and shades of green are common. Dark olive to almost black and brown nymphs predominate darker tannin and algae type lakes. Some immature Darner species have distinct pale green to white thoracic banding, a color trait worth imitating. In the Pacific Northwest a small #8 Half Back with a white wing case is a great fall pattern when immature nymphs are abundant. Sprawler nymphs are ambush feeders, possessing small body hairs that trap silt and debris masking their true color. Sprawlers nymph dropped in a small dish for closer examination cloud the water as they shed this debris and silt walking around. 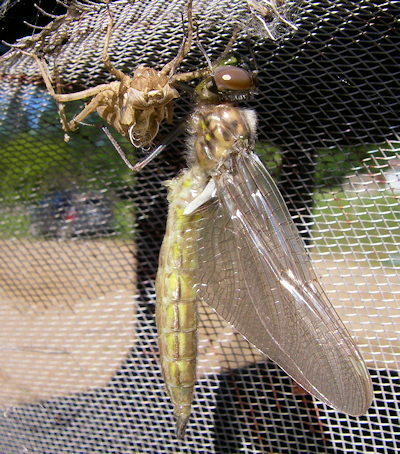 Due to a dragonfly’s long nymphal cycle, up to four years in some species, they must shed their exoskeleton a number of times. When it is time to shed, a split forms along the thorax and a new and improved nymph crawls out, a little bigger and showing signs of future development such as larger wing pads. Freshly moulted nymphs are bright and vulnerable and temporarily become shy and reclusive. Sensing their vulnerability, moulted nymphs dart for cover until their exoskeletons darken, typically within a few days. Depending upon the family species and environmental local conditions dragon nymphs pass through 12 instars before reaching maturity. Dragon fly adult coloration is as varied as the species. Libellulidae adults are gorgeous. Many species have bright vibrant bodies. I have seen a variety of colors from rusty brown to powder blue. In the central plateau of British Columbia, red-bodied adults are common. Many species have dark wing patches. Darner adults are commonly combinations of blue and green, darkening as they mature. Specific color schemes identify certain families such as the black or brown yellow-banded Cordulegastridae adults. Dragons typically emerge from late spring through mid summer, latitude and elevation affect emergence timings. The lower the latitude or elevation the earlier the emergence. Dragons migrate into the shallows prior to crawling out of the water and emerging into winged adult. Emergences are not epidemic in nature, but a large plodding nymph does not escape opportunistic trout or bass. Upon reaching the shore, mature nymphs clamber up shoreline vegetation, trees and rocks. The nymphs are capable hikers, trekking considerable distances before finding the just the right place to transform. During this time, dragon nymphs are particularly vulnerable. Opportunistic birds pick of scores of migrating nymphs. I recall watching large concentrations of robins hopping along a shoreline. Their presence revealed a late morning Sprawler emergence. The transformation from nymph to adult is slow and time consuming, up to 2 hours in some instances. Many species emerge nocturnally to avoid predation. Warm water temperatures trigger nocturnal emergences. Cooler temperatures result in late morning hatch activity and are more common during the late spring. Once capable of flight, adult dragons return to their predatory ways. Adult dragonflies are capable pilots travelling long distances in search of prey and mates. Some Darner species are capable of long distance migration flights. 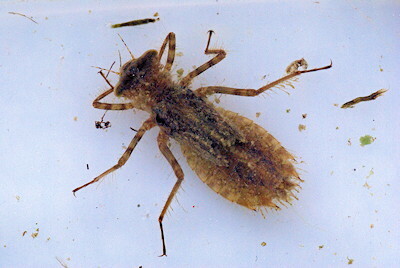 Libellulidae are competent flies but are not nearly as bold, preferring to stay within close range of their natal waters. Adult dragons dine on the fly, using their legs to seize and hold their prey as they shred it. Dragons take a heavy toll on resident mosquitoes and other biting insects. Making it worthwhile to put up with the darting and hovering around your head, their large compound eyes checking you out. It is common to see adult dragons pursuing each other. Territorial males chase invaders and of course potential mates. Dragons mate in similar fashion to damselflies, males grasping females behind their heads using tail mounted claspers. The female reaches her abdomen forward to the male’s thorax completing copulation. Gravid females deposit their eggs by tapping the surface or directly into vegetation, a common practice with Aeshnidae. Dragon adults survive after mating living through the summer succumbing to the autumn frosts. Website created and managed with Tourism Website Builder from Interactive Broadcasting Corporation.